Facebook on Friday admitted that it accidentally underreported the number of iPhone hits on some Instant Articles content between Sept. 20 and Nov. 30. potentially affecting both publishers and advertisers. The issue has already been solved, and new estimates will be supplied, Facebook stated. Specifically the problem involved Facebook's legacy comScore integration and publishers who use HTTPS —comScore alerted Facebook to the situation. iPad and Android traffic was unaffected, according to Facebook. 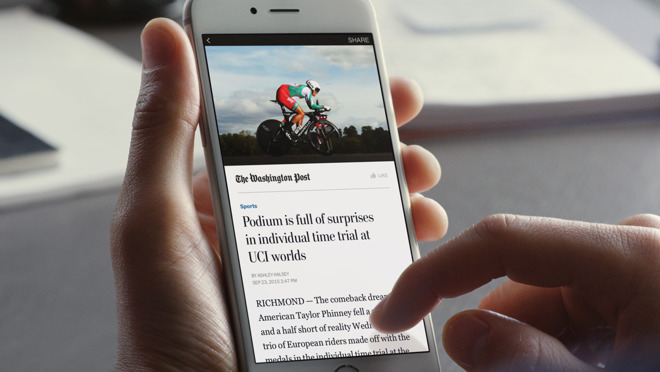 Instant Articles are engineered to load up to 10 times faster on mobile devices than regular Web links. Publishers must specifically sign up to participate, but in theory the benefit is more customer engagement for Facebook, publishers, and advertisers alike, since readers won't have to back out of slow-loading content. Facebook has had to publicly correct its metrics in the past —in September for instance, the company acknowledged a mistake in video tracking that drastically increased viewing times. Separately, Facebook also noted on Friday that it's changing the way it forecasts the potential audience reach for advertising.